This is a great recipe for meal prep. It makes a huge pot of chili that you can have for lunches and dinners all week long. In Hawaii we eat chili with rice, but growing up on the mainland we always had chili with warm fresh tortillas. Both are an excellent addition to this hearty soup and make it a well rounded winter meal. 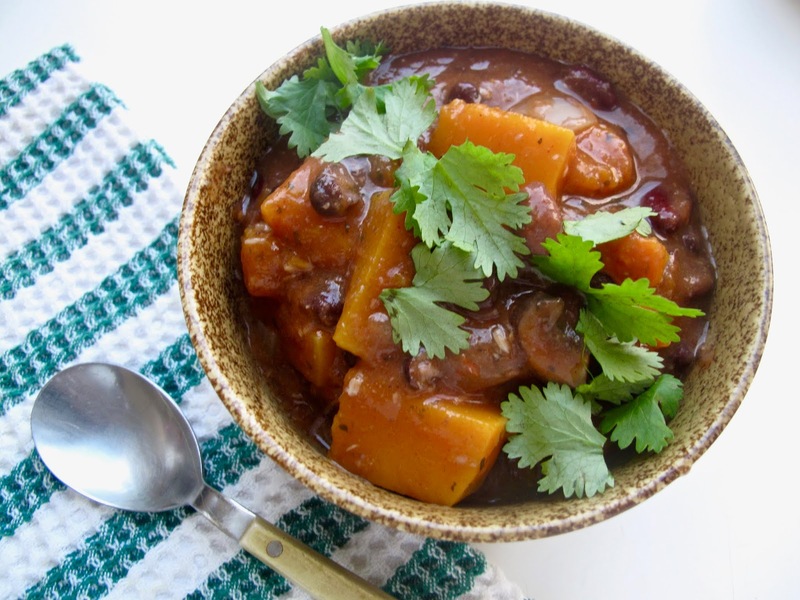 This recipe can be done with butternut squash, pumpkin, kabocha squash, or even sweet potato. Don't be intimidated by squash, sure that initial incision can be challenging, but I've got some tips for you. When cutting a butternut squash, even the largest gourd can be conquered with the right approach. First, cut off the very top of the squash where the stem was attached, then cut the squash right at the base of it's neck, before it flares out into the section full of seeds. The neck section is the easiest to deal with. While it is standing upright on a cutting board, carefully peel with a knife. Slice the entire section in half and then cube or slice according to your recipe. The section that holds the seeds can be more difficult to maneuver, though not impossible. Cut it in half and then scoop out the seeds with a spoon. Cut off the bottom of the section where the knot is so it will stand up steadily on the cutting board. Use a knife to carefully peel. This can be difficult depending on the shape of your squash but just take your time. You can use a peeler here as well but I have found that to be even more time consuming. 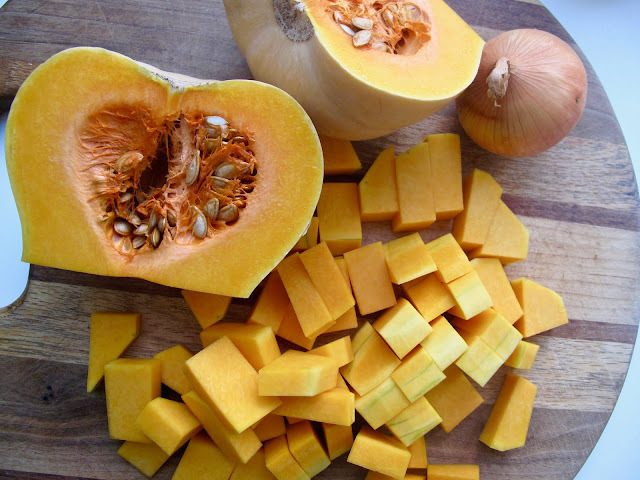 Tips for smaller squash: place the entire squash in a pot of boiling water for a few minutes, rotate to get all sides. Remove the squash and wait until it is cool enough to handle before cutting. Once you've conquered the cutting, it's just throwing everything into a pot! *Roasting garlic adds a complex and rich flavor to any meal. Just cut off the top of a head of garlic, drizzle with olive oil, and wrap in foil. Roast in the oven at 350 degrees F for about 25 minutes, or until the top begins to brown and the aroma fills your kitchen. I used to roast garlic all the time but it can be time consuming, I was inspired to roast again since working with Down to Earth Hawaii, more on this later. Allow the roasted garlic to cool enough to handle, then using a fork you can easily remove the individual cloves. They'll be super soft so no need to chop, it will turn into a roasted garlic paste instantly! Sometimes you can even just squeeze the head of garlic to extract the paste, careful not to get any of the skins into your recipe. 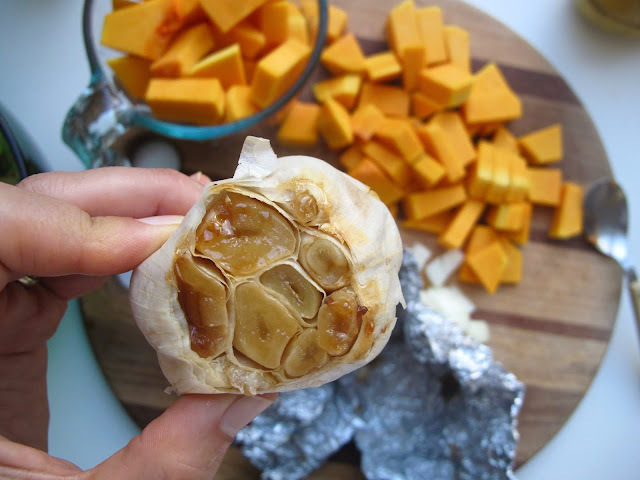 When using roasted garlic you can use much more due to the subdued flavor. If replacing roasted garlic for raw garlic in any recipe, usually one head of roasted garlic can be substituted for each 1-2 cloves raw. Heat the olive oil in a large soup pot. Add the diced onion and minced raw garlic, if you are using it. Cook the onions until soft and translucent, then add the roasted garlic, if you are using it, the cubed butternut squash, blended tomatoes, 3 cups of water, and spices (salt, pepper, cumin, smoked paprika, and chili powder). Cover and bring to a low simmer until squash is tender, about 15-20 minutes. Uncover and add the beans, drained and rinsed. If you'd like a thicker chili whisk together 2 Tbsp cornstarch with 1/2 cup water and add to chili. 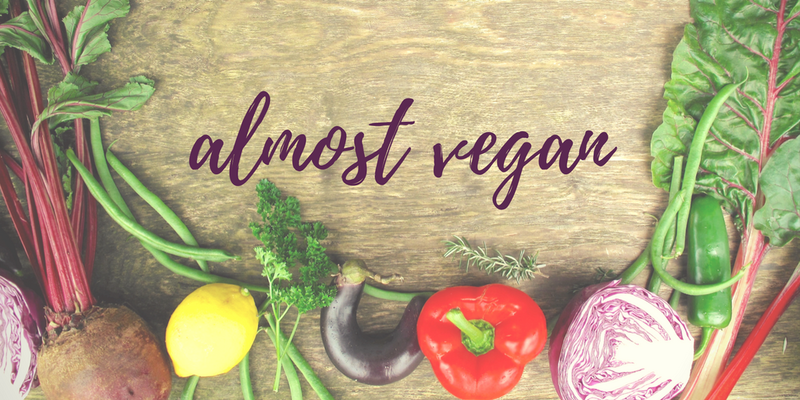 Add other veggies if you have them like bell peppers (add with the onions at the beginning), mushrooms, or greens. 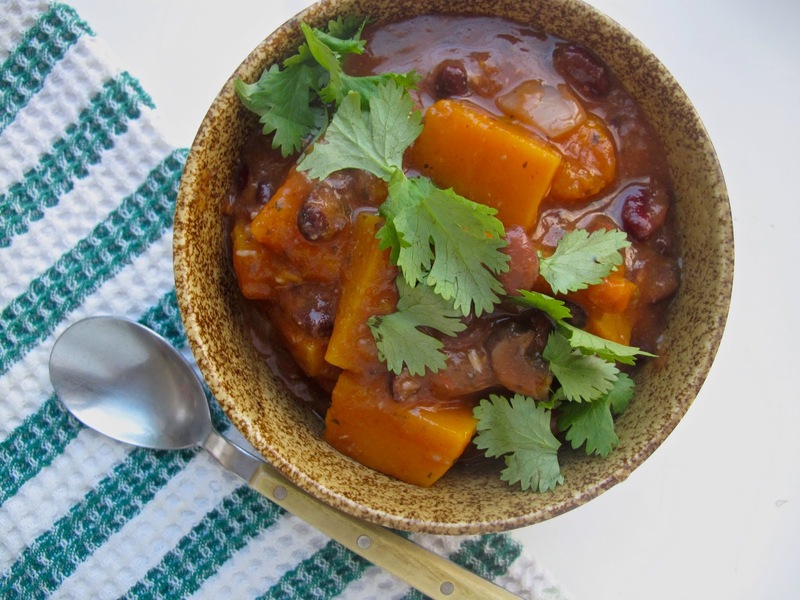 This chili is rich and hearty, perfect for a fall or winter meal.